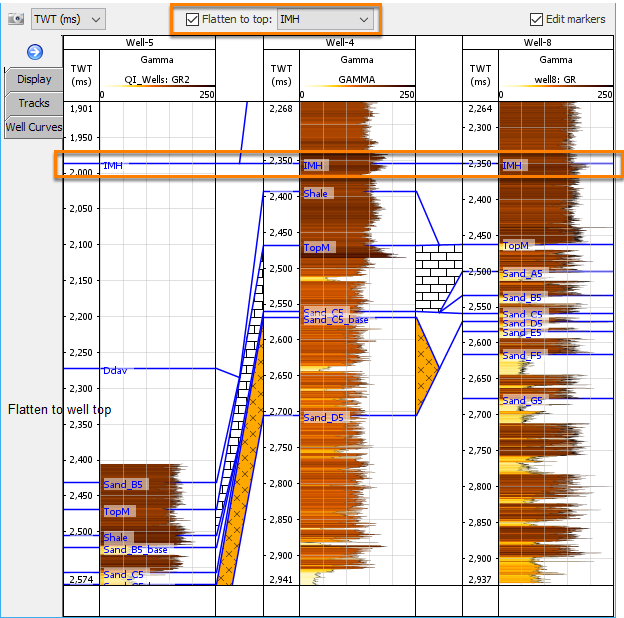 The Well Correlation View displays one or more wells for comparison and stratigraphic interpretation. 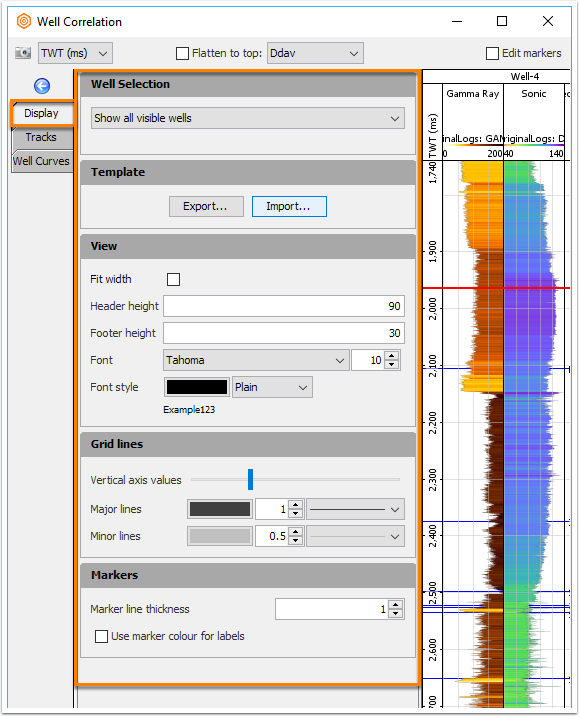 The view uses templates to build and customise the display of well log data. The Display tab controls which wells are included, manages view templates, and adjusts settings for the entire view. Show all visible wells - Display all the active wells. Show visible wells near arbline - Display all the active wells near a selected arbline (see Arblines). Show Selected Wells - Display the wells in the list. Use SHIFT + scroll-wheel to quickly browse wells. The Template, View Settings, Grid Lines and Markers sections affect the display of the view. 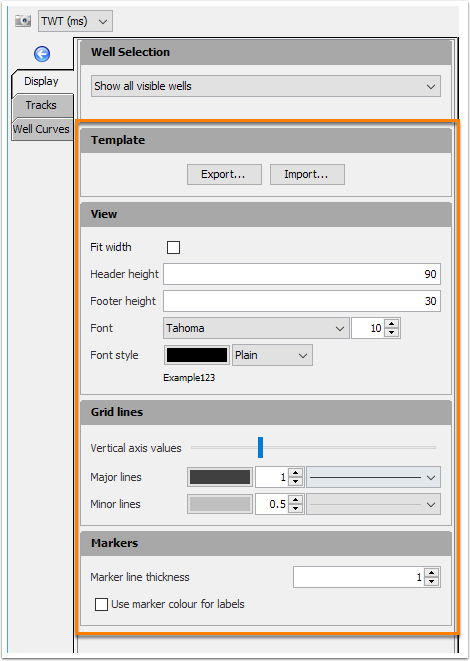 Read more about templates, view settings, grid lines and markers. In the navigation bar, click the Flatten to top check box. Select the marker to flatten to in the adjacent drop-down box. The example above shows three wells flattened to well marker "IMH". The Connections Track is only available in the Well Correlation View. It configures the space drawn between wells. The connection track width varies according to the distance between the wells. The connection track is the same width between all wells. Use value 0 sets track width to fit evenly in the view. The track width is proportional to the well-to-well distance. Minimum: The size in pixels between the closest pair of wells. Maximum: The size in pixels between the widest spaced wells. 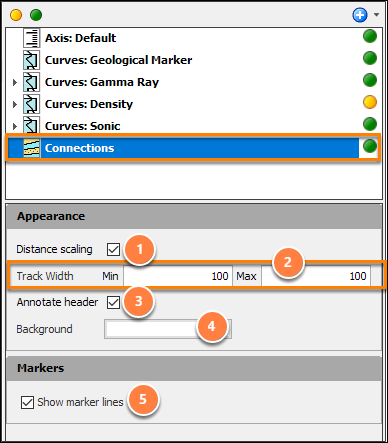 Annotate header: Include well-to-well distance and direction in the connection track header. Background: The track background colour. Show marker lines: Include well marker lines across the tracks.